Good tool for light jobs or small spaces! The Kitchen Plus 2000 Food Processor Cookware Set is a hand operated 20-piece set that offers many chopping, slicing and other assorted plates to handle a variety of kitchen and meal preparation jobs. Interchangeable blades Fit into one unit with crank handle. 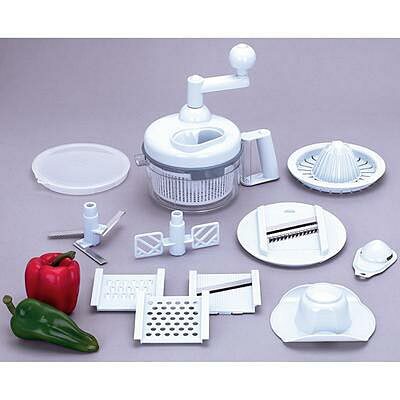 Multiple pieces Offer variety in jobs accomplished with this kitchen tool.